The earliest patents for bamboo go back to 1864 by Philipp Lichtenstadt who wanted to create a “new and useful process for disintegrating the fibre of bamboo so that it may be used in manufacturing cordage, cloth, mats, or pulp for paper.” Yet somehow, despite the availability of the material, it’s only been within recent years that commercially viable bamboo clothing has made it into the mainstream. Bamboo is 100% biodegradable & is the fastest growing plant in the world. I was initially drawn to it as a fabric as it is incredibly soft, personally I think that bamboo is to cotton what cashmere is to wool. It is also warm thanks to the hollow microfiber (like wool) and most importantly it is breathable & wickable (draws moisture away from the skin). It is reputed to keep you 4% cooler than cotton in the heat. Bamboo has other wonderful properties too; it is antibacterial as bacteria does not live well in this fabric. It is anti-static so it sits well next to your skin, not clinging uncomfortably to your head. It offers UV protection by cutting out 98% of harmful UV rays so perfect when worn on your head in sunny climes. Bamboo is ideal for sensitive skin so perfect if your scalp becomes sore, dry & itchy during chemotherapy treatment. It is also anti-fungal. Therefore bamboo is ideal for anyone undergoing any sort of medical treatment. In other words bamboo is the most wonderful fabric combining amazing softness with all of the benefits of breathability, both warmth & coolness depending on the climate. It is wickable, antibacterial, anti-static, offers UV protection & has anti-fungal properties. 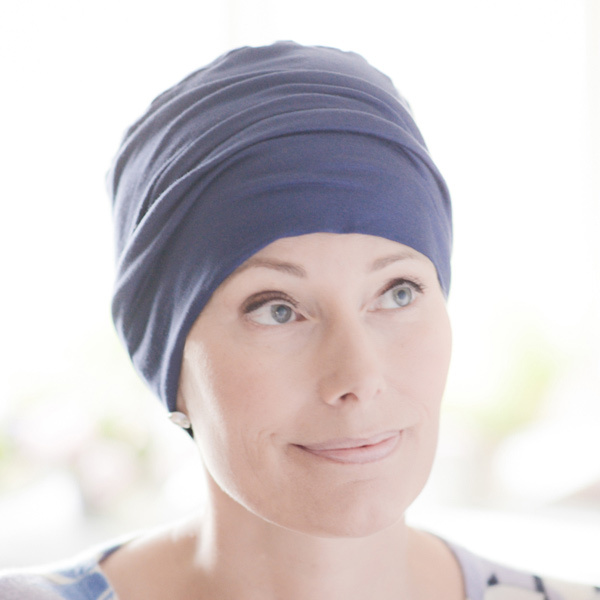 This is why I have chosen it as the solid colour jersey fabric for each of my chemo headwear styles that use a stretchy jersey fabric – the Lucy turban, the Kitty sleep hat, the Olive gathered hat & the Rose banded chemo hat. All of these are incredibly soft & comfy to wear.